This is the second article on this site regarding Deputy Attorney General Rod Rosenstein's recent statement/press conference and his announcement of the indictment of thirteen Russian individuals and three Russian organizations for alleged interference in the 2016 US Presidential election. What follows is a partial nonverbal analysis of the Q & A portion of this brief presser. 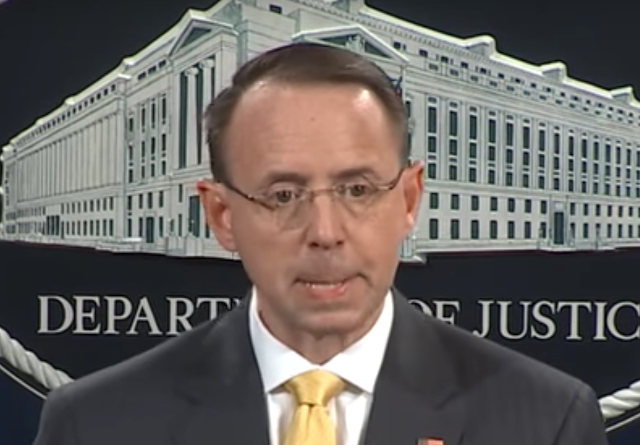 ROD ROSENSTEIN (beginning at 6:35): I want to thank the federal agents and prosecutors who are working on this case for their exceptional service and I’ll be happy to take a few questions Ω Jack. JOURNALIST (JACK): Is there concern that this - the indictment undermines the outcome of the election? 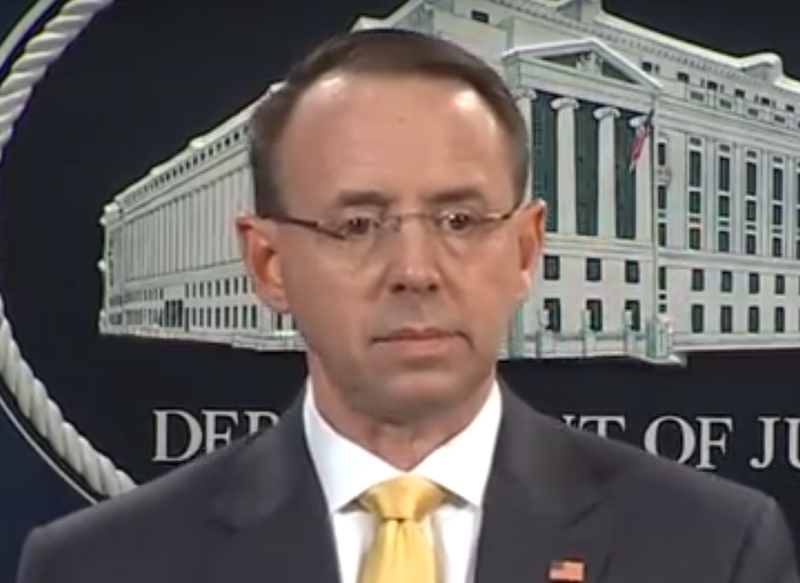 ROD ROSENSTEIN: What I have identified for you are the allegations in the indictment. There's no allegations in the indictment of any effect on the outcome of the election. Jessica ∆ . JOURNALIST (JESSICA): On page four of the indictment, paragraph six, it specifically talks about the Trump campaign, saying that defendants communicated with unwitting (7:09, subtle loose tongue jut) individuals associated with the Trump campaign (hard swallow). My question is later in the indictment, campaign officials are referenced not by their name, by, by campaign official one or two (button your lip/Sssh, 7:18) or three. Were campaign officials cooperative, or were they duped? What was their relationship with this? 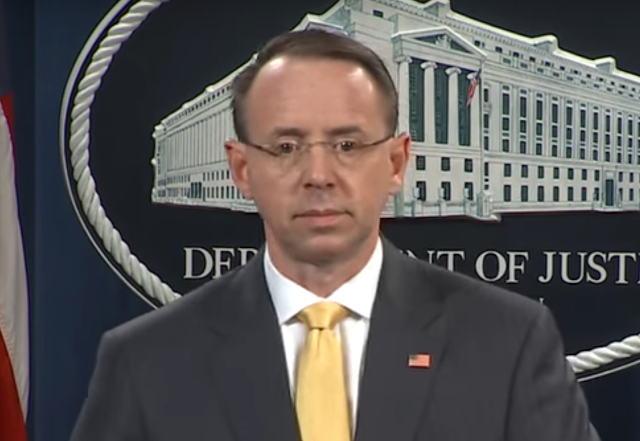 ROD ROSENSTEIN: Then there’s no allegation in this indictment that any American had any knowledge - and the nature of the scheme was the kept defendants took extraordinary steps to make it appear they were ordinary American political activists - even going so far as to - base their activities on - a virtual private network here in the United States, so if anybody traced it back (7:44 - 7:45) to the first jump, they appeared to be American. Catherine. 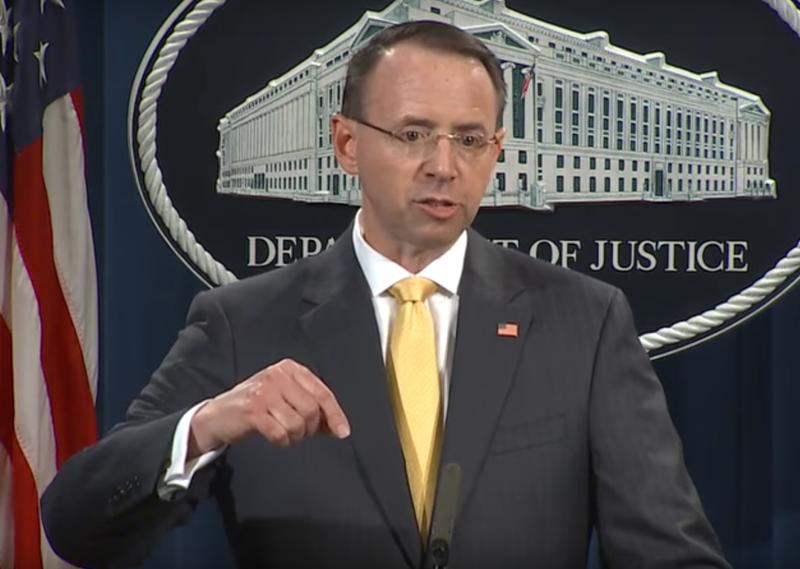 ROD ROSENSTEIN: There've been no, ah, communication with the Russians about this. We’ll follow the ordinary process ah, of seeking cooperation and extradition. Thank you very much. 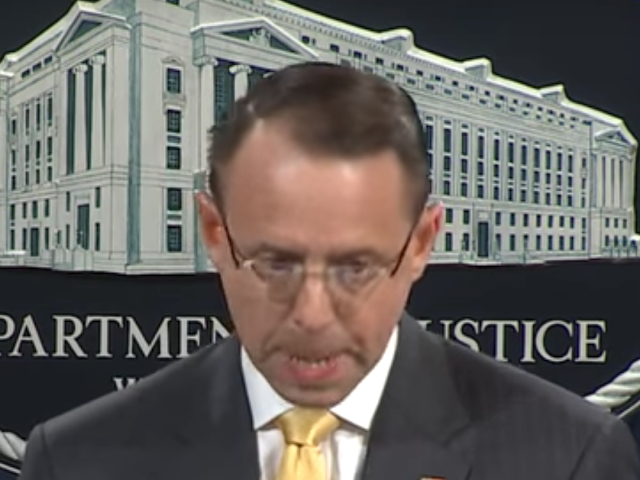 During 6:44, a split-second prior to calling on the journalist named Jack, Deputy AG Rosenstein scrapes/bites his lower teeth on his upper lip (and notated by the Ω symbol). This Bite Your Lip sign reveals his Anxiety - and more specifically - his Hesitancy to Disclose. During 7:00, just after he says "Jessica", he displays another Bite Your Lip maneuver (notated by the ∆ symbol). 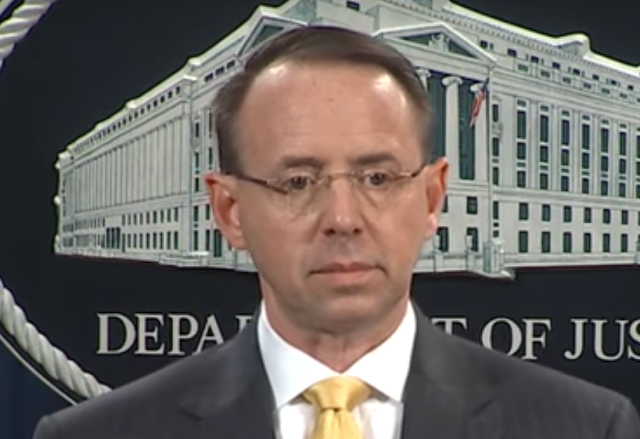 These indicate Deputy AG Rosenstein does not want to fully reveal what he is thinking-feeling. During 7:09, he displays a subtle Loose Tongue Jut as the journalist, Jessica, says, "unwitting". This is an indication of the emotion of: I've been caught (Navarro). It's yet another signal that not everything is being disclosed here. It's important to emphasize that Deputy AG Rosenstein is NOT lying - but he's afraid - and he knows Jessica is implying an important distinction here. 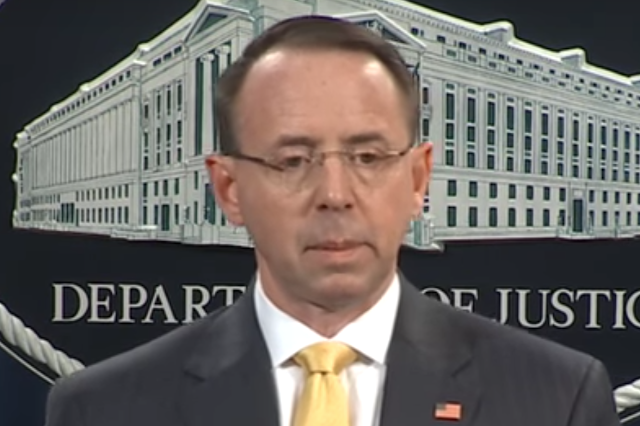 During 7:10, Rosenstein exhibits a Hard Swallow as Jessica says,"individuals associated with the Trump campaign". A hard swallow is a nonspecific anxiety indicator. During 7:18 as Jessica says, "one or two", Deputy AG Rosenstein displays a particular sub-type of Mouth Cover. This brushing/rubbing of the lip (particularly with the thumb) indicates the thought-emotions of: Ssssh, Be Quiet, and Button your lip. This is a further indication of a desire not to disclose further details. During 7:22 - 7:23 as Jessica says, "cooperative", he displays another good example of a Hard Swallow - a further indication of significant Anxiety. During 7:44 - 7:46 as he says, "United States" - Rosenstein is Bouncing up on Toes in excitation. He is proud that this tactic of the Russian election interference has been uncovered. During 7:53 - 7:54, as the journalist, Catherine, says "individuals for prosecution" - the Deputy AG displays a Swaying Side-to-Side dynamic. In this context, this nonverbal signal projects the thought-emotions of: Swagger, I'm ready, and Bring 'em on. Summary: Although Deputy AG Rod Rosenstein was honest during this press conference - he also displayed a strong hesitancy to disclose further information: That although these particular indictments are directed only toward the named Russian individuals/organizations - they do not exempt anyone else - nor preclude any future, related indictments - including more members of the Trump campaign. Moreover, Rosenstein has knowledge such indictments are forthcoming.